For the New England clergyman, see Peter L. Pond. Pond began his fur trading career with his father out of Detroit, Michigan. He traded throughout Minnesota and Wisconsin. Through his business he became acquainted with Alexander Henry the elder, Simon McTavish and the brothers Thomas, Benjamin and Joseph Frobisher. They formed the North West Company which developed a fierce rivalry with the Hudson's Bay Company. In search of new fur resources he explored west of the Great Lakes. In 1776–1778 he wintered at a fur post he established at the junction of the Sturgeon River and North Saskatchewan River near present-day Prince Albert, Saskatchewan. The site is today a National Historic Site. In 1785, one copy of Pond's map, accompanied by a detailed report, was submitted to the United States Congress and a second to the Lieutenant-Governor of Quebec, Henry Hamilton. Pond needed financial support to carry his explorations to the limits of North America's northwest, but the British government was not forthcoming. A partner in the North West Company, founded in 1784, he was in charge of the company business in the Athabasca and Peace River areas. An ambitious man with a reputation for having a violent temper, he was implicated in two murders (one of a rival trader): Although acquitted on the murder charges, the company replaced him with Alexander Mackenzie. In the process of taking over the management of the business Mackenzie learned a great deal from Peter Pond about the Athabasca and Peace River region. Pond left the North West Company in 1788. Mackenzie was intrigued by Pond's belief that the tributaries of that area, which could be seen gathering into a great river flowing northwestward, flowed to the Northwest Passage. Mackenzie took the initiative to follow up on Pond's belief and followed this great river to its mouth; the watercourse, now called the Mackenzie River, did in fact flow to the Northwest Passage section of the Arctic Ocean. Peter Pond had contributed to the mapping of Canada by drawing the general outline of the river basin that Mackenzie recorded in 1789. 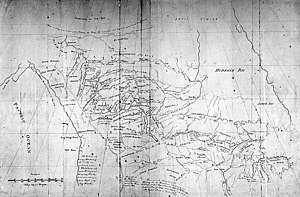 The maps that Peter Pond subsequently drew, based on his explorations and on the information provided to him by First Nations peoples, ultimately gained international recognition for Pond at the end of the 18th century. In 1790, Pond sold his shares in the North West Company to William McGillivray. He returned to Milford, Connecticut, where he died in 1807. ^ Fedirchuk, Gloria (June 1990). "Peter Pond: Map Maker of the Northwest (1740-1807)" (PDF). Arctic. Calgary: Arctic Institute of North America. 43 (2): 184–186. doi:10.14430/arctic1609. Retrieved 2013-08-13. ^ "Peter Pond". Alberta: How the West was Young, Fur Trade and Mission History. Collections Canada. Archived from the original on 2016-03-16. Retrieved 2013-08-13. ^ Pond, Peter National Historic Person. Directory of Federal Heritage Designations. Parks Canada. ^ Hayes, Derek (2006). Historical Atlas of Canada: Canada's History Illustrated with Original Maps (illustrated ed.). Vancouver: Douglas and McIntyre. p. 141. ISBN 978-1-55365-077-5. ^ "Peter Pond - Milford, CT - Connecticut Historical Markers". Waymarking.com. Milford Preservation Trust. October 2010. Retrieved 2013-08-13. Chapin, David (2014). Freshwater Passages: The Trade and Travels of Peter Pond. University of Nebraska Press. Gough, Barry M. (1983). "Pond, Peter". In Halpenny, Francess G (ed.). Dictionary of Canadian Biography. V (1801–1820) (online ed.). University of Toronto Press.